When you’ve had time to find yourself, it makes everything that much better. I married my soulmate two weeks before I turned 40, in part because I wanted to be married while still in my 30s. Little did I know that love in my 40s would become the full-blown greatest hits of loving. My midlife love came about because it took me a while to muster the courage to leave the wrong person in search of the right person (me). When I divorced my first husband, part of me believed I’d be looking for love. What I didn’t realize was that I had to stand alone and love myself before I could find the kind of love I’d always wanted — all-in, be-who-you-are, laugh-a-lot love. I have friends who didn’t find their Mr. Right until their 40s, and it wasn’t because they left one that didn’t work for a relationship that did. Friends who held out for the right relationship into their 40s found they were universally happier because they’d had time to define who they are, they were more confident, and because they’d held out for all the right details. 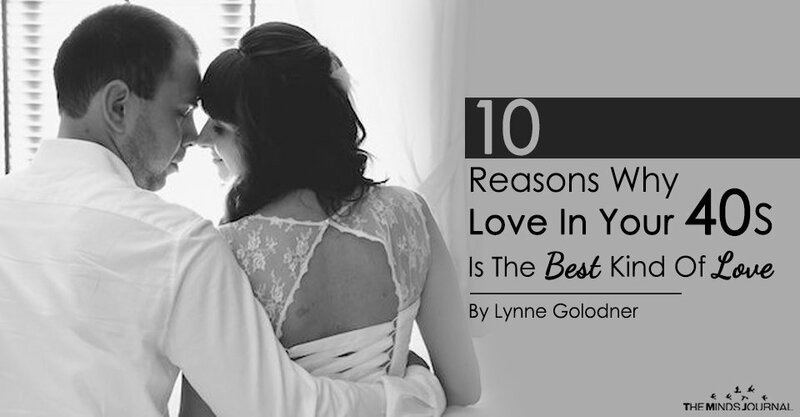 Here’s what I know about why love in your 40s is the best kind of love. 1. You aren’t going to put up with bullsh*t — and you aren’t going to dish it out, either. By the time I met my husband, I knew that a romantic relationship was the icing on the cake of a great life. He isn’t the cake. We’re both whole, happy individuals with full lives. We’re together because we want to be together. We’re together because we make each other better. And at our ages (I’m 44, he’s 48), we don’t have interest or patience in playing games. We’ve been there and done that. It’s time for no-nonsense, utter-honesty, straight-on love and fun. 2. You’re confident in your own skin. It makes baring it to another easy and exciting. Recently, my husband and I had a conversation about how little it matters who we were within years past. I remember in my 20s feeling the need to come clean about how many guys I’d slept with, and how many times I’d thought I was in love. By the time you turn 40, none of that matters. It’s ancient history. It’s the precursor to who you are now. Your mastery in the sack is part midlife confidence, part years of hands-on research. No judging. 3. You’ve had time to develop your interests and talents, and build a career and an identity. It’s a relationship of equals. When we married, my husband had been at his job for 15 years. I’d written thousands of articles, had eight books published, and owned a successful company. We both brought children into the world. We know what we like to do in our spare time, and we’ve traveled a fair amount of the globe. By your 40s, you’ve each had a deep bucket of life experiences, and now it’s time to share those in the realest sense. 4. You’ve held out for the right relationship. Why be with someone if it’s not right? In your 20s, it’s easy to be with someone because it’s fun and flattering. A bar-night pickup doesn’t have to turn into the love of your life. But that gets old. By your 40s, you know it’s great to be alone, so if you’re going to share your life with someone, they’d better be worth it. 5. You’ve given up the notion that there’s one right person. And you’ve made your peace with the notion that no relationship is going to offer you everything. Frankly, that’s the best way. If you find someone you really love being with — with whom you can talk and play and explore the world — isn’t that enough? By your 40s, you know friends, sisters, colleagues and acquaintances each have their role to play. So Mr. Right doesn’t have to be Mr. Everything, right? Lynne Meredith Golodner (&amp;lt;a href=&amp;quot;http://www.lynnegolodner.com&amp;quot;&amp;gt;www.lynnegolodner.com&amp;lt;/a&amp;gt;) is an award-winning author and entrepreneur with&nbsp;thousands of articles and eight books, including The Flavors of Faith: Holy Breads (2013). Her public relations and business messaging development firm, Your People LLC (&amp;lt;a href=&amp;quot;http://www.yourppl.com&amp;quot;&amp;gt;www.yourppl.com&amp;lt;/a&amp;gt;) provides strategic storytelling, relationship-building and higher purpose as the keys to success. In 2016, Lynne formed One Earth Writing (&amp;lt;a href=&amp;quot;http://www.OneEarthWriting.org&amp;quot;&amp;gt;www.OneEarthWriting.org&amp;lt;/a&amp;gt;), a 501c3 public charity that uses writing to build confidence in teens while connecting them with peers from different races, religions and socioeconomic origins. A Fulbright Specialist, Lynne is a graduate of the University of Michigan and Goddard College.